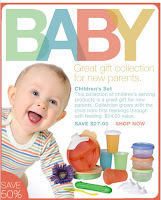 Save 50% on a HUGE selection of Tupperware products for your baby! This collection of children's serving products includes Divided Dish Set with Easy-Grip Handle, Bell Tumbler Set, Sipper Seal® Domed Set, Ideal Lit'l Bowl Set and exclusive Baby Feeding Spoon & Case. Recommended for children 6 months and up. Ideal for storing and serving baby foods prepared in advance. Includes two Divided Dishes; each includes one 6-oz. section and two 2 ¼-oz. sections. Includes four 7-oz. (200 mL) Bell Tumblers. Includes four Sipper Seals in White. Includes three 8-oz. (250 mL) containers with seals. Perfect for bite-size morsels and homemade baby foods. This spoon is ideal for when babies begin eating solid food or when a child begins self-feeding. Shallow curve of the spoon bowl means more food per spoonful. The long spoon also reaches deep into taller jars of baby food. Recommended for ages 4-12 months. Includes spoon and travel case. Visit Tupperware.com and buy Tupperware products online! Microwave and Freezer Safe Heat 'N Serve Set on Sale! Save 40% off our Microwave and Freezer safe Heat 'N Serve container set through February 29, 2008 only! This modular, 7-pc. set of our popular Heat 'N Serve™ microwave Tupperware containers is great for fridge and freezer storage, as it maximizes available storage space. These are one of my favorite Tupperware products! Set includes four 2-Cup/500 mL Square Round Containers, two new 5-Cup/1.2 L Square Round Containers and one 8-Cup/1.9 L Square Round Container. Store, freeze, microwave, reheat and serve, all in one container. Automatic valve enables steam to escape when reheating foods in microwave. Center hub eliminates over-heated edges and under-heated centers. Only $64.20 for this whole set! SAVE $42.80—$107.00 value! Click here to visit Tupperware.com and order online! Contact me and and request my Heat 'N Serve Microwave Recipes!